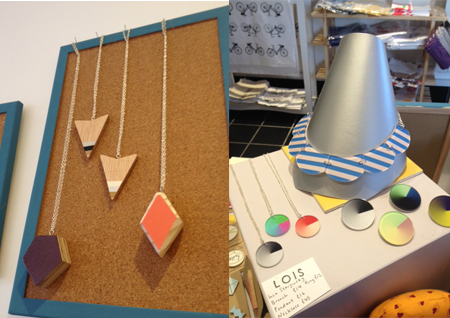 I recently discovered a fantastic new design store in Peckham called LOIS via a friend who was wearing a whale necklace she had bought from there. The necklace, it turns out, is designed by Brighton based jewellery company Designosaur which creates unique necklaces, rings and brooches from acrylic and cherry wood. My friend who bought the necklace is studying for a degree in Animal Behaviour so it’s the ideal piece of jewellery for her! Headed up by designers Jacques Keogh and Karli Dendy, Designosaur’s signature pieces include laser cut renditions of dinosaur silhouettes and skeletons and can be found in a number of boutique shops, including in Brighton’s North Lanes as well as the Natural History Museum in London. Design lovers of Peckham will rejoice in the fact that SE15 has a shop that stocks them too and it’s with all credit due to Helen Ward who set up LOIS that that’s the case. 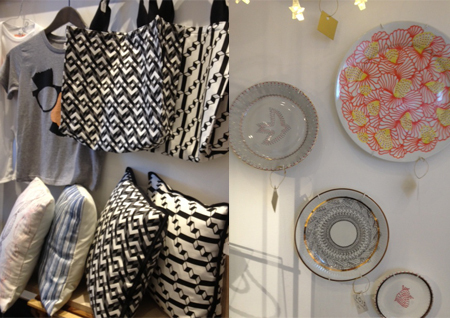 LOIS is a new shop in Peckham selling handcrafted items made by designers, makers and artists working in the UK. Set in a store on Choumert Road, LOIS epitomises how Peckham has changed a great deal over the past few years and caters for SE15’s new demographic of young design conscious residents who prefer to buy hand made, limited run design goods than anything that’s mass produced or too commercial. 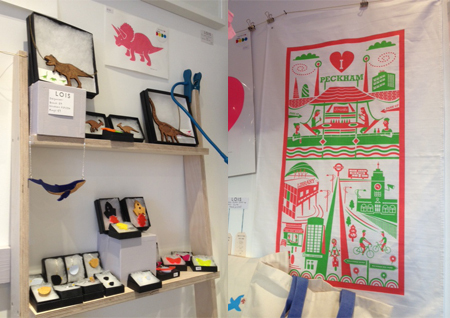 What’s really fantastic is that LOIS supports local designers and amongst the pieces for sale are an ‘I love Peckham’ screen printed tea towel designed by Ray Stanbrook and a ‘Made in Peckham’ mug made by Captured on the Rye. But it’s certainly not all Peckham branded goods on offer, that’s just scratching the surface of what you can find in this treasure trove of design goods. Jewellery that caught my eye included beautifully simple hand crafted wooden triangle necklaces designed by Lucie Ellen, a modern striped petal necklace designed by Inca Starzinsky from her ‘Bloom’ range which sits alongside her ‘Spin’ pendants and brooches which are made from digitally printed two-ply laser cut acrylic and brightly coloured geometric design pendants by Clare Willard, assembled with a palette of coloured laminate and wood. 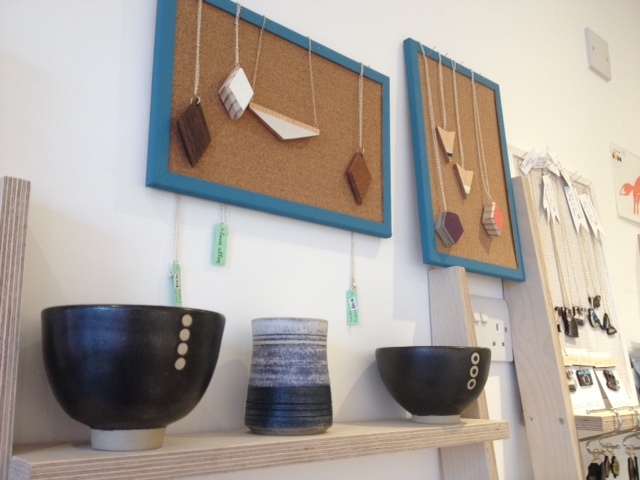 Other jewellery to note includes designs by Rosita Bonita, an independent designer with a speciality in leather jewellery. Each of Rosita’s pieces are lovingly handcrafted in her East London studio, beginning as original illustrations which are then screen-printed or foil-embossed onto fine leathers & carefully assembled into unique & collectable treasures. 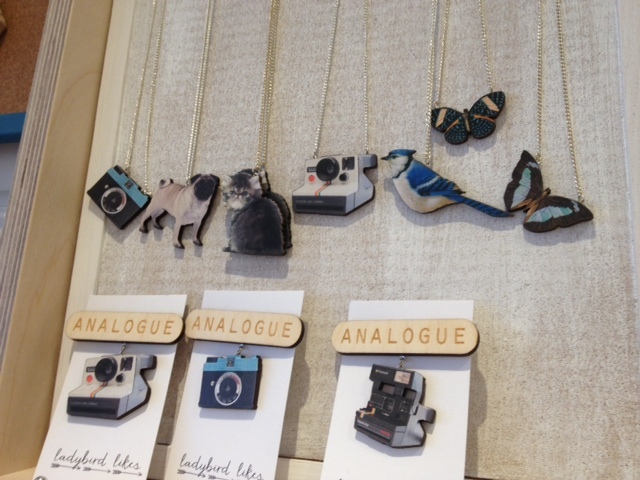 You will also find some very cute jewellery by Ladybird Likes. Zoe Jade from Ladybird Likes designs items made from laser cut wood and vintage inspired imagery including butterflies, cats and old Polaroid cameras. Asides from jewellery there are many other accessories waiting to be discovered, including a range of striking monochrome geometric print canvas bags by The Pattern Guild, a Peckham based design studio founded by Amber James and Fergus McDonnell whose aim is ‘to create functional products with beautiful patterns’. 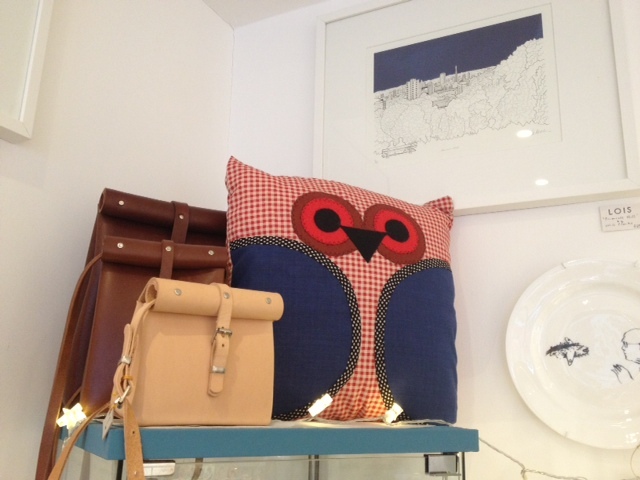 There are also some particularly beautiful leather bags designed by accessory designer Chloe Stanyon. Graduating in 2011 from the prestigious Cordwainers with a degree in Footwear Design Technology and winning the Drapers Award for the “Student Footwear Designer of the Year 2010”, Chloe produces hand crafted leather pieces which are classic shapes with a modern twist. When it comes to pieces for the home, Lois doesn’t fall short. 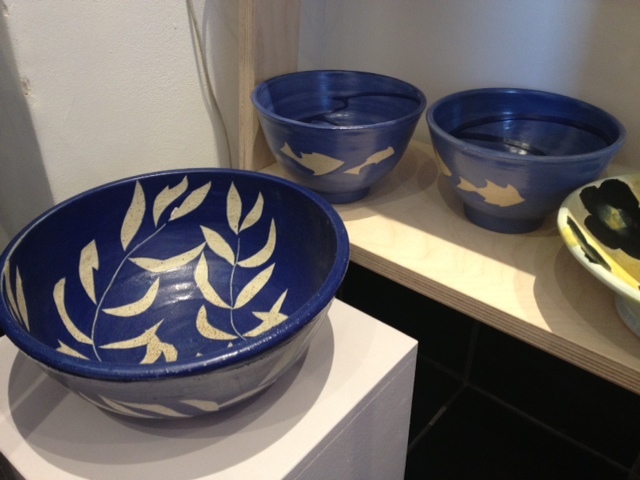 Whilst I was in the store, the designer behind Pleuville Pottery was chatting to the the owner, and her beautiful rustic blue and white stoneware designs stand out amongst the overall contemporary vibe. On a more understated note are some gorgeous ceramic vessels made by Charlotte Grinling, a part time lecturer at Goldsmiths who has created a range of bowls and vases inspired by mid 20th century designs. Decorating the walls are a variety of porcelain plates including a hand painted bird plate designed by Paula McGurdy and a highly intricate hand painted pattern plate by Pen & Gravy. 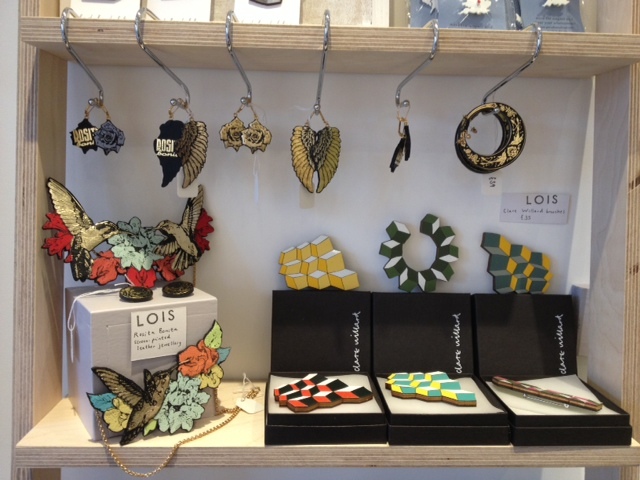 For anyone interested in design and looking for something a little different than what you find on the high street, LOIS is a shop you really must visit. Prepare to be wowed by the carefully selected collection of hand made and small production run pieces for sale designed by an array of very talented designers. It really won’t disappoint.